Rangana Herath, playing his 93rd and final Test, reached his 100th Test wicket at Galle – equalling the record held by countryman Muttiah Muralitharan and England’s James Anderson to have taken 100 or more wickets at a single venue. The wicket was also his 431st overall to take him level with former New Zealand legend Richard Hadlee. He needs four more to climb further in the all-time wicket taker’s list. Muralitharan had taken 100 wickets or more at Galle, Kandy and SSC Colombo, while England paceman James Anderson holds the record at Lord’s. Herath reached the milestone with none other than England captain Joe Root, who came down the track and missed after a breezy 35 run knock. Root had steadied England’s ship after the visitors found themselves 10/2 after debutant opener Rory Burns was caught behind off Surange Lakmal and Moeen Ali was bowled next ball. Burns had been given the tough task of replacing stalwart Alastair Cook following his retirement in September after the India series. After Root, Dilruwan Perera dismissed Keaton Jennings four short of his fifty before bowling Ben Stokes around his legs as he missed the slog sweep. At lunch on the opening day, Jos Buttler was unbeaten on 10 and wicketkeeper Ben Foakes, another England debutant, on five. 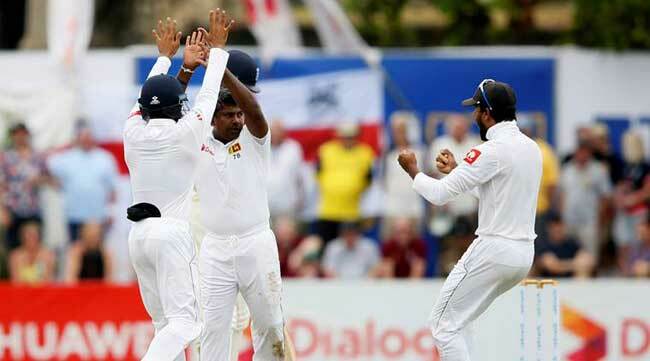 England stood at 113/5 after the first session in the first of three match series.